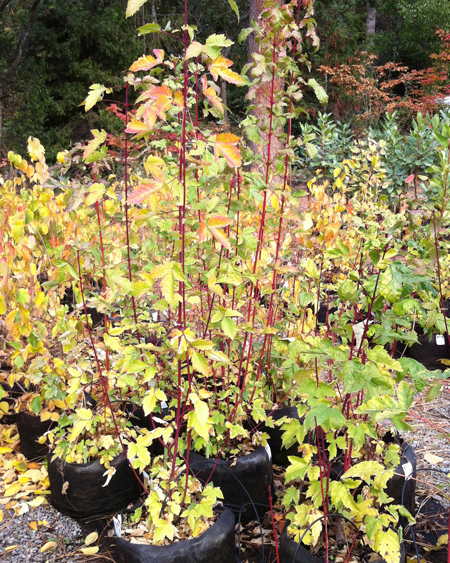 A charming native, similar to and often found with Vine Maple, the Douglas Maple also has brilliant fall color. Twigs and buds are red in the winter, adding to its year-round beauty. Douglas Maple grows much like the Vine Maple, shrubby and compact or taller and more open, according to its growing conditions. It is a most desirable species, seldom found in nurseries. Use it to lighten and brighten a conifer planting, in a mixed border, or as an attractive specimen. It can be massed, alone, or with other small maples, to good effect. An October visit to Mt. Rainier dazzles the eyes with hillsides of Douglas and Vine Maple thickets. Breathtaking! A small, multi-stemmed tree, similar to Vine Maple, it grows to six feet in the open, twenty feet or more under some conditions. Leaves are 3- to 5-lobed, shiny above and lighter below, and turn bright yellow, orange, and red in the fall. It may be found along Union Creek and Crater Lake, and throughout the Cascades. Best with some shade as in its natural habitat of mountain slopes and canyons in coniferous forests, the Douglas Maple is important habitat as it provides good cover, nesting sites, seeds and flowers. Our Seed comes from plants we find around McDonald Creek near Wagner Butte.